Strictly from the standpoint of durability, the best type of flooring for a house with small children would be hard and non-fibrous, such as laminate, engineered wood, luxury vinyl, or ceramic tile. That works from the standpoint of practicality, but comfort is seriously lacking. So for kid-friendly carpet, it is a delicate balancing act of durability vs. comfort. Young children will subject your floors to various abuses: spilled food, abrasion, dyed liquids like fruit punch, blood, and soda. When choosing the best carpet for children, stain resistance, durability, and softness are the key characteristics a carpet should have. Fiber type certainly makes a big difference in the performance of carpet. There are three popular types of fibers to choose from: PET (polyester), nylon, and triexta. All are 100% inorganic fibers. Wool is a popular carpeting fiber, but it is not the best option for houses with children. 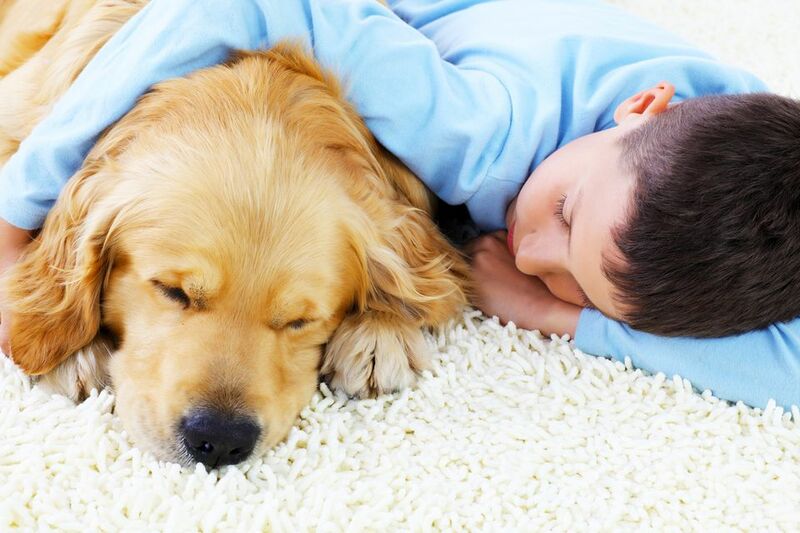 PET: Budget-friendly, eco-friendly PET carpet is remarkable for its sustainability and inherent stain resistance. Nylon: Nylon sets the standard for softness, beauty, and long-lasting durability. Triexta: Triexta is unique in that it combines both exceptional durability with permanent built-in stain and soil protection- no other fiber can make this claim. Modular (tile-type) carpet provides the advantage of allowing you to switch out sections of carpeting as needed. Stains that cannot be cleaned can be thrown out. With a box or two of carpet squares stored in a closet, you can call in a carpet installer or handyman for a quick replacement. While modular carpet may be a fit for some homeowners, it is not a common choice made by residential consumers. Commercial modular carpet tiles are commonly used for commercial applications with heavy traffic such as offices, waiting rooms, indoor public areas and more. Still, for rooms that are dedicated to kids' use such as bedrooms, nurseries, or playrooms, you may decide to install modular carpeting while the child is small. After the child has matured, you can switch to a more conventional type of carpet or hard flooring. If you've ever had your furniture or carpet cleaned, you've had the expensive option of Scotchgard added as a layer of protection. While you may decline the Scotchgard option for furniture, you may want to consider it for carpeting. Factory-applied Scotchgard is not the same as the Scotchgard sprayed on your couch, post-cleaning, or added to the initial cleaning fluid. Scotchgard that is applied in the manufacturing facility surrounds each individual fiber to protect the entire carpet, from fiber tips clear through to the carpet backing, for total stain and soil protection. This stain and soil resistance will never wash off, walk off or wear off. This soft, durable and sustainable fiber is an ideal choice for homes with children.